When Jeff Fielder created my cover for The Boy Who Loved Fire, he used stock images. 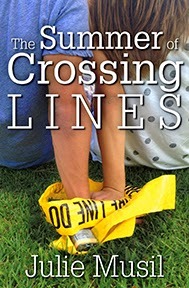 When it came time to design the cover for my next release, The Summer of Crossing Lines, we hit a roadblock. My protagonist infiltrates a theft ring and crosses moral lines. I envisioned a teen boy and girl...plus police tape. Try searching for that on stock photo sites, and you’ll see some strange images. Seriously. None of it worked for me. While my designer explored other options, I worked to create the image I saw in my head. My sister has always been the family photographer. It’s not a profession for her, but a hobby she loves. We set a date to have some fun with photos. If your ideal shot includes real people, try recruiting people you know. Lucky for me, I have a handsome teen son who has a beautiful girlfriend. They agreed to be models just for the fun of it. The girlfriend’s parents were also on board. If your friends or their kids are willing to be on a book cover, be sure to tell them you may not use the photos but you’re exploring your options. This will avoid hurt feelings if you don’t use them. The models can bring a few wardrobe changes. It just so happened that my son and his girlfriend wore shirts that worked together. One thing I didn’t consider was the girl’s white shirt. It created some issues with font color, but the cover designer figured a way around it. I knew I wanted police tape and a padlock, so I brought those. Bring anything you think will be fun to place in the photo. Worst case is you don’t use it. Consider choosing a location where you can switch things up. We chose my sister’s house, because she has great landscaping. But we quickly moved from there to the local elementary school, where the final image was shot. It took us a few camera clicks to realize the sun was messing up our shots. We moved to a shady location, where we could get the lighting right. The final shot hadn’t even been part of the plan. It was at the end of the day when my son and his girlfriend were just hanging out. My sister and I saw them side by side and shouted, “Don’t move!” It was the perfect accidental shot. Even though we’re really close with the girlfriend’s parents, I asked them to sign a release form. The mom totally understood and had no problem signing it. You never know where life takes you, and it’s a good idea to protect your models and your work. Information about photo releases and sample forms can be found here. Once I narrowed down my favorite photos, I emailed them to J. Allen Fielder, my cover designer. He then went to work on creating a professional cover for ebook and print. If you can’t find what you’re looking for on stock sites, or you want an original image that no one else can use, consider taking the photos yourself. My best advice? Just have fun with it! Do you have any friends or family members who like taking photos? Would you ever consider taking your own cover shots? If you’re an expert photographer, is there anything you’d like to amend or add? Chicory, so true! And thanks to digital cameras it makes it even easier. Heh. I majored in illustration and design. If I had to, I could do my own covers. As with taking the photos in the first place, it's best to try a lot of different ideas and play around with the design until you get it just right. Sometimes the best designs are nothing like what you first envisioned. Never be afraid to try something new. One of the best things about digital photography is NEVER RUNNING OUT OF FILM! :) The other very best thing is not having to develop the film to see if the pictures are any good. Absolutely, Elissa. That's how we figured out our shadow was funky--by checking the screen shots. It's so cool that you majored in illustration and design. I'm sure that comes in handy! This sounds like fun, Julie!! Traci, it was a blast. It was a fun day for the whole family. Great post, Julie, and you did a lovely job. I am glad you tackled this topic! Yes! I love family. =) Great tips. Thanks, Elizabeth. And I adore your new cover! Wow, that is a great shot! What a fun and interesting post. Great information and a great book cover. Thanks for all the tips.